Beautiful unit on Gore Creek with views of Golden Peak. Fireplace, king bed, king sleeper sofa, fully equipped kitchen, 2 bath, balcony, underground parking, two hot tubs, heated pool, gas grills, staff on site. A bargain at $1550.00. Celebrate the Holiday season in style. Beautiful view of Golden Peak. Two bathrooms. Fireplace. Large balcony overlooking Gore Creek. Queen sofa in living room. Plenty of storage. Free bus to slopes. Beautiful Vail Mountain Resort nestled on Gore Creek with mountains in the background viewed from your balcony-next to your warming fireplace. Resort includes heated swimming pool and modern Jacuzzi's. Beautiful winter escape within walking (or skiing) distance to Golden Peak chair lift-or use the resort bus to deliver you to the doorstep. Fully furnished kitchen and beautifully furnished apartment. Beautiful Vail Mountain Resort nestled on Gore Creek with mountains in the background viewed from your balcony- next to your warming fireplace. Resort includes heated swimming pool, warming room and modern Jacuzzi. Beautiful winter escape within walking distance to Golden Peak chair lift-or use the resort bus to deliver you to the doorstep. Fully furnished kitchen and beautifully furnished apartment. A Great Price for a Great Week! Enjoy St Patrick's day festivities! Celebrate Christmas in style. Beautiful view of Golden Peak. Two bathrooms. Fireplace. Large balcony overlooking Gore Creek. Plenty of storage. Great view from top floor with cathedral ceiling overlooking Ford Park and Gore Range. Vail Colorado is one of the best ski areas in the world! Enjoy. Million Dollar View! Beautiful view of Golden Peak from this condo with a cathedral ceiling. Vail is one of the best ski areas in the world and this condo has a Vail Village location. Close to Eagle CO. Great week to be in Vail. Million Dollar View! Beautiful view of Gore Creek and Golden Peak from this condo. Watch the skiing action from your privite balcony or hit one of the two hot tubs. We also have an outdoor heated pool and warming hut. Two weeks open in same condo! 4 Nights - $300 - Super Condo! Million Dollar View! Beautiful view of Gore Creek and Golden Peak from this condo. Watch the skiing action from your privite balcony or hit one of the two hot tubs. We also have an outdoor heated pool and new warming hut. View Gore Creek and Golden Peak from this 2 bath condo. Watch the skiing action from your privite balcony or hit one of the two hot tubs. Walk right out into the outdoor heated pool and warming hut. (5 days = $1200) We also have next week open (52) in unit 412. Take both and we can work a deal! Beautiful view of Gore Range & Ford Park This condo has cathedral ceiling,private balcony and fireplace. Enjoy hot tubs or outdoor heated pool with a warming hut. Walk or take shuttle to lifts. ($1200 for 5 days). We have previous week 51 (different unit) open. Take both and we can make a super deal! Beautiful view of Gore Range and Ford Park from this condo. The condo has a privite balcony and fireplace. You can also enjoy one of the two hot tubs or outdoor heated pool with a warming hut. Price Is Right. Save $650 over Main Office,Super Unit, Great View, Easy Access, an Excellent place to enjoy your Skiing Vacation.Your Home Away From Home. Also listed for Sale at $5800. Great Unit at this Price. Don'tpass up this excellent oportunity. Incredible views of Golden Peakfully furnished - just bring food, libation and great personality! Great week for snow and great view of Golden Peak. Ground floor unit is directly opposite heated pool and hot tubs. Includes parking and free shutte to lifts. Million Dollar View! Beautiful view of Gore Creek and Golden Peak from this condo. Watch the skiing action from your privite balcony or hit one of the two hot tubs. We also have an outdoor heated pool and warming hut. unit balcony faces ski slopes, lifts, and beautiful gore creek. only unit with murphy bed, sleeps 6. the wren location and amenities are top drawer. i have been coming to vail since it opened. call for further info. thanks! Only steps to the pool and hot tubs, ground floor view overlooking Gore Creek and Vail Mountain. President's Week! Spectacular views south, facing the ski slope. Walk to the slopes or take the free shuttle. This condominium has a full kitchen, balcony, and gas fireplace. The Wren has a swimming pool, two hot tubs, and laundry facilities. beatuful unit facing the golden peek ski area. five minute walk to ski lift or ride the wren ski van. Newly upgraded unit - week 9 is excellent in Vail ! Bargain price for this time of year ! Shuttle provided to all ski lifts ! Million dollar view! beautiful view of gore creek and golden peak from this condo. watch the skiing action from your privite balcony. Hot tubs & outdoor heated pool on site. Bargin price for a March ski week! won't last long. Two nights in Vail during the best ski time. Thursday and Friday night at half the price of the resort. Perfect week! Great snow and moderate temperatures. Private ground floor patio with beautiful view of ski slopes from LR with gas fireplace. Just several steps to outdoor heated pool, hot tubs, warming hut and gas grills. Free underground parking. Watch the deer along Gore Creek from your patio. Outstanding views of the slopes and Golden Peak. Just steps from the front door to the pool and hot tubs. Best Spring skiing week. Prime Spring Ski Week, Living Room with Gas Fireplace and View of the Gore Range. Huge Master Bedroom with King Sized Bed and Gas Fireplace. Second Bedroom has King Sized Bed. TV x 3. This unit normally rents for $ 525.00 per night during Week 12. Top floor unit, great view. Great ski week! Unit sleeps 4. One bedroom and couch-bed. Beautiful view of ski hill & Gore Creek. Shuttle to lifts. Lg. pool, hot tubs, game room, covered parking. Close to ski-rentals. restaurants, shops, nightlife. Clean. quiet comfortable. Great family place. Also trout fishing starts. Prime week, Great views of Gore Range. Would consider also renting week 53 (New Years) Walking distance to Village and Lifts. Celebrate Christmas season in style. Beautiful view of Golden Peak. Two bathrooms. Fireplace. Large balcony overlooking Gore Creek. Plenty of storage. Can combine with week 51 for 14 total days. Prime Holiday Week, good views of Gore range. In Vail Village, walk to shops and the slops. Flexable, email offers. Vail's greatest treasure-Skiing while living in an apartment with a panoramic view of Golden Peak. Watching the skiing activities while sitting next to the fireplace or walking out on the balcony-overlooking Gore Creek!. 2 full baths accomodating 4 persons. Heated swimmming pool, jacuzzis,van. New Year's Eve in Vail. 2 blocks from Vail Village and slopes. Given the Gold Crown Award by RCI. Balcony, Cathedral ceiling, views of Gore Range, full kitchen, fireplace and much more! Rent my week 52 - same unit - and we'll give you a deal! Great views of the Gore Range overlooking Betty Ford Park. Private parking, free shuttle to the lifts, private balcony. Great views of the Gore Range overlooking Betty Ford Park. Private parking, free shuttle to the lifts, private balcony,heated pool, 2 hot tubs, fireplace in living room, fully equiped kitchen. Friendly, knowledgable, professional staff. Great way to start the year at a bargain price. Vail Village condo with wonderful views of the Gore Range overlooking Betty Ford Park, private balcony, fireplace, fully equiped kitchen, private parking, free shuttle to lifts, heated pool, 2 hot tubs, warming hut, friendly, knowledgable staff. Great way to start the new year at a bargain price. Beautiful view of Gore Range & Ford Park This condo has cathedral ceiling,private balcony and fireplace. Enjoy hot tubs or outdoor heated pool with a warming hut. Walk or take shuttle to lifts. This excellent resort is in Vail Village. Very nice condo overlooking Ford Park and Gore Range. Everyone Loves our Condo. Arthritis has taken away my Skiing enjoyment. Enjoy Skiing while you are able, to enjoy it. "Ed". $1275 under contract for rent in 2006 for sale in 2007, overlooking ford park and gore range. vail colorado is one of the best ski areas in the world! everyone has loved our unit. arthritis has taken away my skiing enjoyment. enjoy skiing while you are able. have fun while you are able. Ground floor unit, steps to the pool and hot tubs, private parking, free shuttle to the lifts, on Gore Creek overlooking Golden Peak. Ground floor unit, steps to the pool, warming hut and 2 hot tubs, private parking, laundry, free shuttle to the lifts. Fireplace in living room, fully equiped kitchen,private patio on Gore Creek overlooking Golden Peak. Friendly, helpful, profesional staff on site. Great deal in Vail Viliage. View Skiing on Golden Peak. Short walk to lifts. Balcony faces slopes and creek.Two hot tubs. Million Dollar View! Beautiful view of Gore Creek and Golden Peak from this condo. Watch the skiing action from your private balcony or hit one of the two hot tubs. We also have an outdoor heated pool and warming hut. Best view in Vail! Sleeps 6! Ground floor unit, steps to the pool, warming hut and 2 hot tubs, private parking, laundry, free shuttle to the lifts. Fireplace in living room, fully equiped kitchen,private patio on Gore Creek overlooking Golden Peak. Friendly, helpful, profesional staff on site. Great deal in Vail Village. Million dollar view! Beautiful view of gore creek and golden peak ski slopes from this condo - 2 bathrooms! Watch the skiing action from your privite balcony or hit one of the two hot tubs. The resort also has an outdoor heated pool and warming hut. Excellent February Ski week! Walk to the ski lifts and restaurants from this Vail property. This condominium has a full kitchen, private balcony and gas fireplace. The Wren has a heated swimming pool, two hot tubs, and wonderful views from all units. President's week! Million Dollar View! Beautiful view of Gore Creek and Golden Peak from this condo. Watch the skiing action from your privite balcony or hit one of the two hot tubs. We also have an outdoor heated pool and warming hut. Best view in Vail! President's Day Holiday Week. Panoramic view of the ski slope from the balcony. Short walk to the lift, or take the shuttle. Extremely comfortable accomodations & centrally located to shopping & restaurants. Fireplace & kitchen in the unit, common area jacuzzi & pool. Maid service twice weekly. President's Week in beautiful Vail Colorado - the skiing is perfect and the view from the balcony is incredible. The condo has a kitchen, fireplace, and two baths, and is walking distance to the ski lift. Parking is underground, and a common area has a pool, hot tubs, and barbeque. One of the six best units at The Wren. Watch skiers come down golden peak. Heated pool,hot tubs,bus service everything you need. Spectacular views south, facing the ski slope. Walk to the slopes or take the free shuttle. This condominium has a full kitchen, balcony, and gas fireplace. The Wren has a swimming pool, two hot tubs, and laundry facilities. Perfect ski week and mountain. Incredible views of Gore Creek and Golden Peak, private balcony, heated pool, 2 hot tubs, warming hut, laundry, free 2 way shuttle to lifts, livingroom fireplace, fully equiped kitchen, king bed. Vail Village bargain. Friendly, helpful, profesonal, onsite staff. Million Dollar View! Beautiful view of Gore Creek and Golden Peak from this condo. Watch the skiing action from your privite balcony or hit one of the two hot tubs. We also have an outdoor heated pool and warming hut. Best view in Vail! Saturday night! Only $250. Normal rate is $380.Balcony faces ski slopes and Gore Creek. This condo has a full kitchen, private balcony, gas fireplace and two bathrooms. The Wren has a heated swimming pool, two hot tubs. Walk to the ski lifts and restaurants from your condo. Million Dollar View! Top floor! Beautiful view of Golden Peak from this condo with a cathedral ceiling, best unit in building. Vail is one of the best ski areas in the world and this condo has a Vail Village location. Million Dollar View! Beautiful view of Gore Creek and Golden Peak from this condo. Watch the skiing action from your private balcony or hit one of the two hot tubs. We also have an outdoor heated pool and warming hut. Best view in Vail! Perfect week! Great snow and moderate temperatures. Private ground floor patio with beautiful view of ski slopes from LR with gas fireplace. Full kitchen. Just several steps to outdoor heated pool, hot tubs, warming hut and gas grills. Free underground parking. Walk or use free shuttle to slopes. Great Spring Break Week. Top floor with vaulted ceilings and extra windows. In Vail Village, walking distance to shops and slopes. Ground floor unit, steps to hot tubs and pool, overlooking Gore Creek and Vail Mountain. Bargain ski week for a great price. Top floor, cathredial ceilings, great views of the Gore Range, overlooking Betty Ford Park, private parking, free shuttle to the lifts. Great price for a Vail ski season condo. Celebrate Christmas season in style. Beautiful view of Golden Peak. Two bathrooms. Fireplace. Large balcony overlooking Gore Creek. Plenty of storage. This is a four day rental which includes Christmas Eve and Christmas Day. newly reduced view skiing on golden peak. short walk to lifts. balcony faces slopes and creek.two hot tubs. Great deal on a great week. Snow is always good this week and lift prices are reduced. See pics on www.thewren.com. Heated pool, two hot tubs, shuttle to the lifts, walking distance to town and view of the slopes! This is the week, the unit, and the city. President's Day week in Vail, Colorado, with spectacular views of the ski slope across the Gore creek from the 3rd floor. Two hot tubs, covered parking, laundry, kitchen, fireplace. You can either walk to the slopes or take a shuttle from the Wren. Enjoy. Perfect ski week. Incredible views of Gore Creek and Golden Peak. Private balcony,heated pool,2 hot tubs,warming hut,laundry,free 2 way shuttle to lifts. LR with fully equippedkitchen,king bed.Vail Village bargain! Want to stay in Vail Village,walk to shops and slopes this is the place. Great spring skiing.Fantastic views of the slopes from your private balcony,heated pool,2 hottubs, laundry, free shuttle or walk to lifts,full kitchen,living rm,king size bed,fireplace,free garage parking on site. See whats new in Vail and Stay at this family friendly resort. After one stay your sure to return. Trillion Dollar View! Top floor unit with fireplace and private balcony overlooking beautiful Gore Creek and the Golden Peak ski runs. King bed, full kitchen, free parking and shuttles to and from the lifts. Only steps to the heated pool and 2 hot tubs. Walk to all the restaurants, shops and lifts in Vail Village/Golden peak area with ease from this condo. This is a $3000 value, only $1950. Experience spring skiing at its finest.Enjoy your morning coffee surrounded by mountain scenery and the refreshing sound of Gore Creek.Shuttle to Golden Peak speed lift at your convenience.Come home to a 99 degree heated pool and two hot tubs.Grill out or use your full kitchen.You may choose to make the short walk to Vail Village for great shopping, dining, and night life. Reserve it now! beautiful condo, walking distance to lifts and the village. Vail's greatest treasure-Skiing while living in an apartment with a panoramic view of Golden Peak. Watching the skiing activities while sitting next to the fireplace or walking out on the balcony-overlooking Gore Creek!. 2 full baths accommodating 4 persons. Heated swimming pool, jacuzzi,van. Prime Holiday Week, good views of Gore range. In Vail Village, walk to shops and the slopes. Remodeled kitchen & bathroom. Easy two minutes shuttle to Golden Peak lifts. Five minute stroll into Vail village. Skiing Vail for a week does not get any more reasonable than this great deal! Just Reduced View skiing on golden peak. Short walk to lifts. Balcony faces slopes and creek. Two hot tubs. President's week! Trillion Dollar View! One bedroom condo with fireplace and private balcony overlooking beautiful Gore Creek and the Golden Peak ski runs. King bed, full kitchen, free parking and shuttles to and from the lifts. Only steps to the heated pool and 2 hot tubs. Walk to all the restaurants, shops and lifts in Vail Village/Golden peak area with ease from this condo. $3000 value! Million $ view!One bedroom condo with fireplace and private balcony overlooking beautiful Gore Creek and the Golden Peak ski runs. King bed, full kitchen,free parking and shuttles to and from the lifts. Heated pool and hot tubs. Warming hut, game room. Short walk into Vail village. 3,000 value, only 1,850. Will easily sleep 4 .Celebrate Presidents week! Last minute cancelllation.One bedroom condo with fireplace and private balcony overlooking beautiful Gore Creek and the Golden Peak ski runs. King bed, full kitchen,free parking and shuttles to and from the lifts. Heated pool and hot tubs. Warming hut, game room. Short walk into Vail village. 3,000 value, only 800. Will easily sleep 4 .Celebrate Presidents week! Experience spring skiing at its finest. Enjoy your morning coffee surrounded by mountains and the refreshing sound of Gore Creek.Shuttle to Golden Peak speed lift on the half hour. After an invigorating day of skiing,relax in our 99 degree heated pool or 2 hottubs.Cook your dinner in the full kitchen or take the easy walk to Vail Village for outstanding dining, shopping, and night life.Super deal! Celebrate Christmas in style. Beautiful view of Golden Peak. Two bathrooms. Fireplace. Large balcony overlooking Gore Creek. Plenty of storage. Shuttle service to ski areas. Resort has heated swimming pool and spas. Great views of the Gore Range overlooking Betty Ford Park. Private underground parking, free shuttle to the lifts, laundry, club room, private balcony, heated pool, 2 hot tubs, fireplace in living room, fully equiped kitchen, king bed & sleeper sofa. Friendly, knowledgable, professional staff. Great way to start the year at a bargain price. Trillion Dollar View! One bedroom condo with fireplace and private balcony overlooking beautiful Gore Creek and the Golden Peak ski runs. King bed, full kitchen, free parking and shuttles to and from the lifts. Only steps to the heated pool and 2 hot tubs. Walk to all the restaurants, shops and lifts in Vail Village/Golden peak area with ease from this condo. $3000 value! Fantastic Vail Condo! One bedroom with fireplace and private balcony with mountain views of beautiful Gore Range. Unit has a king bed, full kitchen, free parking and shuttles to and from the lifts. Property has a heated pool and 2 hot tubs. Walk to all the restaurants, shops and lifts in Vail Village/Golden peak area with ease from this condo. $2200 value, only $1475! Beautiful 3rd floor condo facing the ski slope, and overlooking Gore creek. President's day week. Just steps from skiing and downtown shopping/restaurants. The unit has a full kitchen, fireplace, and 2 bathrooms. The Wren has a swimming pool and 2 hot tubs. Very nice way to spend your ski vacation. President's Week! Fantastic Vail Condo, one bedroom condo with fireplace and private balcony overlooking beautiful Gore Creek and the Golden Peak ski runs. King bed, full kitchen, free parking and shuttles to and from the lifts. Only steps to the heated pool and 2 hot tubs. Walk to all the restaurants, shops and lifts in Vail Village/Golden peak area with ease from this condo. $3000 value! Millon $ view! 1 Bedroom condo with fireplace & private balcony overlooking beautiful Gore Creek and Golden Peak ski runs. King bed, full kitchen, free parking & shuttles to and from the lifts. Heated pool, hot tub and warming hut. Game room, outdoor grills. Short walk into Vail village and outstanding restaurants and shops. Will easily sleep 4. Master bedroom with king bed & private bathroom,queen sleeper sofa,fireplace,private balcony,full kitchen,views of Golden Peak & Gore Creek ski slopes.Comfortably fits 4.Free parking & free shuttles between Wren & ski lifts.Heated pool & hot tubs. Top floor unit overlooking Betty Ford park with great views. Shuttle bus to Golden Peak. Easter week for the best skiing of the year. The Wren has great outdoor heated pool, hot tub, close to town center. Units are very nice and comfortable. Great ground floor unit, steps to the heated pool and hot tubs, covered private parking, 15 minute walk over the covered bridge to the lift or use the free shuttle to the lifts, on Gore Creek overlooking Golden Peak. 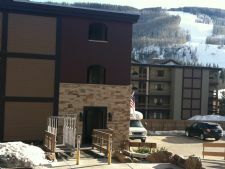 Fireplace, patio, king bed, fully equiped kitchen, 2 blocks east of pedistrian only area of Vail Village, onsite staff. A great bargain. Trillion Dollar View! One bedroom condo with two full bathrooms. Fireplace and private balcony overlooking beautiful Gore Creek and the Golden Peak ski runs. King bed, full kitchen, free parking and shuttles to and from the lifts. Only steps to the heated pool and 2 hot tubs. Walk to all the restaurants, shops and lifts in Vail Village/Golden peak area with ease from this condo. $3000 value! Fantastic Vail Condo! One bedroom with fireplace and private balcony with mountain views of beautiful Gore Range. Unit has a king bed, full kitchen, free parking and shuttles to and from the lifts. Property has a heated pool and 2 hot tubs. Walk to all the restaurants, shops and lifts in Vail Village/Golden peak area with ease from this condo. $2200 value, only $1575! Come for the week - President's Day week in Vail. Wonderful views over Gore creek and Golden Peak ski runs. Walk or take the free shuttle to and from the ski slopes. One bedroom, two bathroom condominium with full kitchen, fireplace, private balcony. The Wren has covered parking, heated pool, two hot tubs, and laundry facilities. Come enjoy the mountains of Colorado in Winter. Trillion Dollar View! One bedroom condo with fireplace and private patio overlooking beautiful Gore Creek and the Golden Peak ski runs. King bed, full kitchen, free parking and shuttles to and from the lifts. Only steps to the heated pool and 2 hot tubs. Walk to all the restaurants, shops and lifts in Vail Village/Golden peak area with ease from this condo. $3000 value! President's week! Trillion Dollar View! One bedroom condo with fireplace and private patio overlooking beautiful Gore Creek and the Golden Peak ski runs. King bed, full kitchen, free parking and shuttles to and from the lifts. Only steps to the heated pool and 2 hot tubs. Walk to all the restaurants, shops and lifts in Vail Village/Golden peak area with ease from this condo. $3000 value! One of the six best units at the Wren. Beatuful views of Golden Peak ski runs and Gore Creek. Heated pool, hot tubs,free parking,shuttle service, everything you need. Walk to lifts, shops and restaurants. Lounge on your private balcony or sit by your fireplace. Best week for spring sking. One of the best six units at the Wren. Beautiful views of Golden peak ski runs and Gore Creek. Heated pool, Hot tubs,free underground parking,free shuttle service, everything you need. Walk to lifts, shops and restaurants. Sit on your private balcony or by your fireplace. Best week for spring sking. Spring ski in Vail! Breathtaking view of Golden Peak and runs. Private balcony overlooks Gore creek. Walk to slopes or take free shuttle. King bed, fireplace, full kitchen. Heated pool and hot tubs.Walk to village and 100 or so restaurants. Free underground parking. Game room. Beautiful top floor unit overlooking Betty Ford Park. Shuttle bus to Golden Peak, walk to Vail Village. King bed in room plus pull out couch in Living Room. Fireplace and fully equipped kitchen. Wren has a heated pool, spa, game room, and breathtaking views. Ground floor unit with access to pool. View of slopes and Gore Creek. The Wren has a heated pool, spa, BBQ grills, game room. King bed and pullout couch, fireplace, fully equipped kitchen. Recent upgrades to furniture and to bathrooms in all units. This is the best bargain in Vail during a spectacular spring ski week! Unit has two full baths, very comfortable place to stay. The best apartment at the Wren 2 bedrooms 2 fireplaces . Beautiful view of Golden Peak Chair lift. Fireplace. Large balcony with view to Gore Creek and Golden Peak. Plenty of storage. Shuttle service to ski areas. Resort has heated swimming pool and spas. Live the mountain life! Ski down path to covered bridge. Best price in Vail. Awesome ski week at Vail. One bedroom condo with full bath. Easily sleeps 4 with 700 SF. Fireplace and private balcony looking up Vail Pass and Gore Range. King bed, full kitchen, free parking and shuttle to and from the lifts. 45 second stroll to the heated pool and 2 hot tubs. Easy walk to all the restaurants, shops and lifts in Vail Village/Golden Peak area. Recent upgrade / renovation. Trillion Dollar View! One bedroom condo with two full bathrooms. Fireplace and private balcony overlooking beautiful Gore Creek and the Golden Peak ski runs. King bed, full kitchen, free parking and shuttles to and from the lifts. Only steps to the heated pool and 2 hot tubs. Walk to all the restaurants, shops and lifts in Vail Village/Golden peak area with ease from this condo. Fantastic Vail Condo! One bedroom with fireplace and private balcony with mountain views of beautiful Gore Range. Unit has a king bed, full kitchen, free parking and shuttles to and from the lifts. Property has a heated pool and 2 hot tubs. Walk to all the restaurants, shops and lifts in Vail Village/Golden peak area with ease from this condo. $2200 value, only $1550! Fantastic Vail Condo! One bedroom with fireplace and private balcony with mountain views of beautiful Gore Range. Unit has a king bed, full kitchen, free parking and shuttles to and from the lifts. Property has a heated pool and 2 hot tubs. Walk to all the restaurants, shops and lifts in Vail Village/Golden peak area with ease from this condo. $2200 value, only $1600! Trillion Dollar View! One bedroom condo with 2 full bathrooms. Fireplace & private balcony overlooking beautiful Gore Creek & Vail Ski Slopes. King bed, full kitchen, free parking and shuttles to & from lifts. Only steps to the heated pool with 2 hot tubs. Walk to all the restaurants, shops and lifts in Vail Village/Golden peak area with ease from this condo. $3000 value! Only $1650. Snowing now in Vail: www.vail.comPresident's day week in Vail! One bedroom two bath condo, on third floor, with fireplace and private patio overlooking Gore Creek and the Golden Peak ski slope. This unit includes a full kitchen, fireplace, television, balcony, covered parking, 2 hot tubs, pool, and laundry facilities. Great spring ski week. Fireplace, king bed, king sleeper sofa, deck overlooking Gore Creek and Golden Peak ski area, underground parking, heated pool, 2 hot tubs, free grills, fully equiped kitchen, 2 full baths, free shuttle to and from the lifts, laundry. Only 3 blocks from the pedistrian only area of Vail Village. Professional staff on site. A real bargain. Perfect ski week and mountain. Incredible views of Gore Creek and Golden Peak, private patio, heated pool, 2 hot tubs, warming hut, laundry, free 2 way shuttle to lifts, underground parking, fireplace, fully equiped kitchen, king bed & sleeper sofa 3 blocks to pedestrain only Vail Village. Vail Village bargain. Friendly, helpful, profesonal, onsite staff. One of the best six units at the Wren. Beautiful views of Golden Peak ski runs and Gore Creek. Full ketchen, heated pool, hot tubs,free underground parking, free shuttle service, shops and reastaurants. Sit on your private balcony or by your fireplace. Best week for spring sking. Snowing now in Vail: www.vail.comPresident's day week in Vail! One bedroom two bath condo, on third floor, with fireplace and private patio overlooking Gore Creek and the Golden Peak ski slope. This unit includes a full kitchen, fireplace, television, balcony, covered parking, 2 hot tubs, pool, and laundry facilities. Walking distance to all of the downtown shopping and restaurants in central Vail. President's week! Trillion Dollar View! One bedroom condo with fireplace and private patio overlooking beautiful Gore Creek and the Golden Peak ski runs. King bed, full kitchen, free parking and shuttles to and from the lifts. Only steps to the heated pool and 2 hot tubs. Walk to all the restaurants, shops and lifts in Vail Village/Golden peak area with ease from this condo. Spring ski in Vail! Breathtaking view of Golden Peak and runs. Private balcony overlooks Gore creek. Walk to slopes or take free shuttle. King bed,sleep sofa, fireplace, full kitchen. Heated pool and hot tubs.Walk to village and 100 or so restaurants. Free underground parking. Game room. great ski week! walk or short free shuttle to slopes/village. beautiful view of the mountain from unit. large 1 br unit. hot tubs, heated pool. rent for only $1,600. this is over a $3,000 value! great ski week! Christmas Week in Vail! One of the best condos on site!Trillion Dollar View! One bedroom condo with two full bathrooms. Fireplace and private balcony overlooking beautiful Gore Creek and the Vail ski runs. King bed, full kitchen, free parking and shuttles to and from the lifts every 15 minutes in the morning. Only steps to the heated pool and 2 hot tubs. Walk to all the restaurants, shops and lifts in Vail Village/Golden peak area with great ease from this condo. Excellent on site staff seven days a weeks. Celebrate New Year's season in style. Beautiful view of Golden Peak. Two bathrooms. Fireplace. Large balcony overlooking Gore Creek. Plenty of storage. Short walk to the slopes, or take advantage of our convenient shuttle. Spacious 1 bedroom, with gorgeous mountain views. And this rental rate is a fraction of what it would cost to rent directly from our management company. Take advantage of this great rate to enjoy North America's leading ski destination! and only minutes to downtown! Terrific view of skiing on golden peak. Short walk to lifts. Balcony faces slopes and creek. Two hot tubs. Trillion Dollar View! One bedroom condo with two full bathrooms. Fireplace and private balcony overlooking beautiful Gore Creek and the Vail ski runs. King bed, full kitchen, free parking and shuttles to and from the lifts every 15 minutes in the morning. Only steps to the heated pool and 2 hot tubs. Walk to all the restaurants, shops and lifts in Vail Village/Golden peak area with great ease from this condo. Excellent on site staff seven days a weeks. Trillion Dollar View! One bedroom condo with two full bathrooms. Fireplace and private balcony overlooking beautiful Gore Creek and the Vail ski runs. King bed, full kitchen, free parking and shuttles to and from the lifts every 15 minutes in the morning. Only steps to the heated pool and 2 hot tubs. Walk to all the restaurants, shops and lifts in Vail Village/Golden peak area with great ease from this condo. Excellent on site staff seven days a weeks. Easy rental terms, $300 to reserve, $300 September 1st and the balance 30 days before check-in. Fantastic Vail Condo! One bedroom with fireplace and private balcony with mountain views of beautiful Gore Range. Unit has a king bed, full kitchen, free parking and shuttles to and from the lifts. Property has a heated pool and 2 hot tubs. Walk to all the restaurants, shops and lifts in Vail Village/Golden peak area with ease from this condo. $2240 value, only $1550! Fantastic Vail Condo! One bedroom with fireplace and private balcony with mountain views of beautiful Gore Range. Unit has a king bed, full kitchen, free parking and shuttles to and from the lifts. Property has a heated pool and 2 hot tubs. Walk to all the restaurants, shops and lifts in Vail Village/Golden peak area with ease from this condo. Trillion Dollar View! One bedroom condo with two full bathrooms. Fireplace and private patio overlooking beautiful Gore Creek and the Vail ski runs. King bed, full kitchen, free parking and shuttles to and from the lifts every 15 minutes in the morning. Only steps to the heated pool and 2 hot tubs. Walk to all the restaurants, shops and lifts in Vail Village/Golden peak area with great ease from this condo. Excellent on site staff seven days a weeks. less than 1/2 price - great ski week! walk or short free shuttle to slopes/village. beautiful view of the mountain from unit. large 1 br unit. hot tubs, heated pool. rent for only $1,350. this is over a $3,000 value! great ski week! Top Floor and the Best Condo! Trillion Dollar View! One bedroom condo with two full bathrooms. Fireplace and private balcony overlooking beautiful Gore Creek and the Vail ski runs. King bed, full kitchen, free parking and shuttles to and from the lifts every 15 minutes in the morning. Only steps to the heated pool and 2 hot tubs. Walk to all the restaurants, shops and lifts in Vail Village/Golden peak area with great ease from this condo. Excellent on site staff seven days a weeks. Fantastic Vail Condo! One bedroom with fireplace and private balcony with mountain views of beautiful Gore Range. Unit has a king bed, full kitchen, free parking and shuttles to and from the lifts. Property has a heated pool and 2 hot tubs. Walk to all the restaurants, shops and lifts in Vail Village/Golden peak area with ease from this condo. $2240 value, only $1495! Trillion Dollar View! One bedroom condo with two full bathrooms. Fireplace and private patio overlooking beautiful Gore Creek and the Vail ski runs. King bed, full kitchen, free parking and shuttles to and from the lifts every 15 minutes in the morning. Only steps to the heated pool and 2 hot tubs. Walk to all the restaurants, shops and lifts in Vail Village/Golden peak area with great ease from this condo. Excellent on site staff seven days a weeks. Easy rental terms, $300 to reserve, $300 September 1st and the balance 30 days before check-in. Excellent summer week in Vail! Trillion Dollar View! One bedroom condo with two full bathrooms. Sleeps 4 with ease and great comfort! Fireplace and private balcony overlooking beautiful Gore Creek and has direct view of Vail mountain. King bed, full kitchen, free parking. Only steps to the heated pool and 2 hot tubs. Walk to all the restaurants, shops and lifts in Vail Village/Golden peak area with ease from this condo. Excellent on site staff seven days a weeks. Amazing condo to enjoy all that Vail in the summer has to offer. Beautiful unit on Gore Creek with views of Golden Peak. Fireplace, king bed, king sleeper sofa, fully equipped kitchen, 2 bath, balcony, underground parking, two hot tubs, heated pool, gas grills, staff on site. A bargain at $1050.00. Christmas Week in Vail! One of the best condos on the property! Trillion Dollar View! One bedroom condo with two full bathrooms. Sleeps 4 great! Fireplace and private balcony overlooking beautiful Gore Creek and the Vail ski runs. King bed, full kitchen, free parking and shuttles to and from the lifts every 15 minutes in the morning by our private shuttle. Only steps to the heated pool and 2 hot tubs. Walk to all the restaurants, shops and lifts in Vail Village/Golden peak area with great ease from this condo. Excellent on site staff seven days a weeks.$3000 value! Holiday special! Million dollar view! 1 bedroom condo with 2 full baths fireplace and private balcony overlooking beautiful gore creek and ski slopes. King bed and sleep sofa. Full kitchen, game room and pool. Free parking and free shuttle to slopes. Short walk to beautiful village of Vail. Trillion Dollar View! One bedroom condo with fireplace and private balcony overlooking beautiful Gore Creek and the Golden Peak ski runs. King bed, full kitchen, free parking and shuttles to and from the lifts. Only steps to the heated pool and 2 hot tubs. Walk to all the restaurants, shops and lifts in Vail Village/Golden peak area with ease from this condo. Ground floor unit with patio on Gore Creek overlooking Golden Peak. Gas fireplace, king bed, king sleeper sofa, 2 bath, fully equipped kitchen, underground parking, heated pool, 2 hot tubs, gas grills, laundry room on site, professional staff on site. Adjacent to Betty Ford park only 3 blocks from the pedestrian only area in Vail Village. A true bargain. Most convenient/nicest timeshare facility in Vail. Walk to Vail Village shops/restaurants and free town bus. Frequent courtesy shuttle to lifts, and Sunday grocery trip. Unit has attractive decor, high end finishes, very comfortable furniture, king in bedroom, new queen sleep sofa in LR; two TVs, DVD player, gas fireplace, balcony, full kitchen, internet access, assigned free parking space. This unit has easy access for loading/unloading luggage/gear and is closest to the shuttle. Wren amenities include computer workstation in the office/reception area, elevator, coin laundry, 2 hot tubs, heated swimming pool, "community" room with tv, pool table, and several game tables, Tuesday wine & cheese party, mid-week maid service. less than 1/2 price - great ski week! walk or short free shuttle to slopes/village. beautiful view of the mountain from unit. large 1 br unit. hot tubs, heated pool. rent for only $1,600. this is over a $3,300 value! great ski week! Private Residence, condo 401. Top Floor! Best Condo! Trillion Dollar View! One bedroom condo with two full bathrooms and sleeping loft. Sleeps 6! Fireplace and private balcony overlooking beautiful Gore Creek and the Vail ski runs. King bed, full kitchen, free parking and shuttles to and from the lifts every 15 minutes in the morning. Heated pool and 2 hot tubs. Walk to all the restaurants, shops and lifts in Vail Village/Golden peak area with great ease from this condo. Fantastic Vail Condo! One bedroom with fireplace and private balcony with mountain views of beautiful Gore Range. Unit has a king bed, full kitchen, free parking and shuttles to and from the lifts. Property has a heated pool and 2 hot tubs. Walk to all the restaurants, shops and lifts in Vail Village/Golden peak area with ease from this condo. $2240 value, only $1450! Nice view with shuttle to Golden Peak.Village or Lionshead. 1 bedroom.Murphy Bed and 2 Baths with great view of mountain ,hot tub and pool . Christmas Week in Vail! Fabulous location with world class skiing and a charming town. Condo is very comfortable including one bedroom with a king size bed, new queen size sofa-sleeper in living room, full bathroom, and kitchen complete with cooking utensils. Cozy up in front of the gas fireplace, enjoy 2 TVs, DVD player and internet access. Condo is in a great location - take just a short walk or enjoy the convenient shuttle to and from the lifts, restaurants and shops in Golden Peak & Vail Village. Assigned free parking space, although you don't need a car in Vail. After skiing relax in the heated pool and 2 hot tubs! Excellent on-site staff every day with complimentary coffee, hot cocoa & hot cider in the reception office. Convenient elevator, midweek maid service, coin laundry, Sunday grocery trip, Tuesday wine & cheese party, and Community Room decorated for Christmas and including TV and pool table. Have a fabulous week! Christmas in Vail. Great Unit. Free covered parking.1 Bedroom, 1 Full Bath. Sofa Bed in Living Room. Sleeps Four. 1 King BedExcellent location. Walking distance to the lifts and Vail Village. Don't wait. Christmas Week in Vail! SKI Christmas day! One of the best condos on site with a Trillion Dollar View! One bedroom condo with two full bathrooms. Fireplace and private balcony overlooking beautiful Gore Creek and the Vail ski runs. King bed, full kitchen, free parking and shuttles to and from the lifts every 15 minutes in the morning. Only steps to the heated pool and 2 hot tubs. Walk to all the restaurants, shops and lifts in Vail Village/Golden peak area with great ease from this condo. Excellent on site staff seven days a weeks. Celebrate New Year's season in style. Beautiful view of Golden Peak. Two bathrooms. Fireplace. Large balcony overlooking Gore Creek. Plenty of storage. Free bus to slopes. Best season of the year! Come enjoy the beautiful views of the mountains and enjoy watching them after a fantastic ski day in front of the fireplace.The Wren has covered free parking! heated pool, two hot tubs, and laundry facilities. Enjoy walking 2 blocks or take the free Shuttle to the lifts, and Vail village. Beautiful Vail Mountain Resort nestled on Gore Creek with mountains in the background viewed from your balcony-next to your warming fireplace. Resort includes heated swimming pool and modern Jacuzzis. Beautiful winter escape within walking distance to Golden Peak chair lift-or use the resort bus to deliver you to the doorstep. Fully furnished kitchen and beautifully furnished apartment. President's week in the best, most convenient timeshare in Vail. Short walk to Vail Village and free town bus. Top floor unit has cathedral ceiling, balcony with East views over Ford Park, gas fireplace, 2 TVs, DVD player, internet access, free assigned underground parking. High end finishes, very comfortable and attractive furnishings, king in bedroom, new queen sleep sofa in LR PLUS queen Murphy bed, full kitchen. Wren amenities include elevator and coin laundry, frequent shuttle to lifts, Sunday grocery trip, Tuesday wine & cheese party, "community" room with TV, internet workstation in office, 2 hot tubs, heated swimming pool, ice maker. Midweek maid service. Wonderful Mountain Views of Gore Range! One bedroom condo with one bathroom. Sleeps 4 persons great! Fireplace and private balcony overlooking beautiful Ford Park and Gore Range. King bed, full kitchen, free parking and shuttles to and from the lifts every 15 minutes in the morning. Only steps to the heated pool and 2 hot tubs. Walk to all the restaurants, shops and lifts in Vail Village/Golden peak area with great ease from this condo. Excellent on site staff seven days a weeks. Best and most convenient timeshare in Vail! Walk to Gold Peak, Vail Village, and free town bus. Wren amenities include 2 hot tubs, heated pool, coin laundry, elevator, internet access (and workstation in office), frequent shuttle to lifts, Sunday grocery trip, Tuesday wine & cheese party. this unit has easy access for loading/unloading luggage/gear, easiest access to the courtesy shuttle, and assigned parking.King in bedroom and new queen sofa-sleeper in LR. Gas fireplace, full kitchen, 2 TVs and DVD player. High end finishes, attractive decor, very comfortable furnishings. Balcony off the LR with views of Ford Park. Week before Christmas in Vail - it's a magical time! Fabulous location with world class skiing and a charming town. Condo is very comfortable including one bedroom with a king size bed, new queen size sofa-sleeper in living room, full bathroom, and kitchen complete with cooking utensils. Cozy up in front of the gas fireplace, enjoy 2 TVs, DVD player and internet access. Condo is in a great location - take just a short walk or enjoy the convenient shuttle to and from the lifts, restaurants and shops in Golden Peak & Vail Village. Assigned free parking space, although you don't need a car in Vail. After skiing relax in the heated pool and 2 hot tubs! Excellent on-site staff every day with complimentary coffee, hot cocoa & hot cider in the reception office. Convenient elevator, midweek maid service, coin laundry, Sunday grocery trip, Tuesday wine & cheese party, and Community Room decorated for Christmas and including TV and pool table. Have a fabulous week and be home for Christmas Day! One of the best condos on the property! Trillion Dollar View! One bedroom condo with two full bathrooms. Sleeps 4 great! Fireplace and private balcony overlooking beautiful Gore Creek and the Vail ski runs. King bed, full kitchen, free parking and shuttles to and from the lifts every 15 minutes in the morning by our private shuttle. Only steps to the heated pool and 2 hot tubs. Walk to all the restaurants, shops and lifts in Vail Village/Golden peak area with great ease from this condo. Excellent on site staff seven days a weeks.$3000 value! One of the best condos on site with a Trillion Dollar View! One bedroom condo with two full bathrooms. Fireplace and private balcony overlooking beautiful Gore Creek and the Vail ski runs. King bed, full kitchen, free parking and shuttles to and from the lifts every 15 minutes in the morning. Only steps to the heated pool and 2 hot tubs. Walk to all the restaurants, shops and lifts in Vail Village/Golden peak area with great ease from this condo. Excellent on site staff seven days a weeks. Celebrate the holiday season in style. Beautiful view of Golden Peak. Two bathrooms. Fireplace. Large balcony overlooking Gore Creek. Plenty of storage. Free bus to slopes.Beautiful Vail Mountain Resort nestled on Gore Creek with mountains in the background viewed from your balcony-next to your warming fireplace. Resort includes heated swimming pool and modern Jacuzzi. Beautiful winter escape within walking distance to Golden Peak chair lift-or use the resort bus to deliver you to the doorstep. Fully furnished kitchen and beautifully furnished apartment. Special discount for rental of two adjoining weeks. Celebrate the Holiday season in style. Beautiful view of Golden Peak. Two bathrooms. Fireplace. Large balcony overlooking Gore Creek. Plenty of storage. Free bus to slopes. Beautiful Vail Mountain Resort nestled on Gore Creek with mountains in the background viewed from your balcony-next to your warming fireplace. Resort includes heated swimming pool and modern Jacuzzi's. Beautiful winter escape within walking distance to Golden Peak chair lift-or use the resort bus to deliver you to the doorstep. Fully furnished kitchen and beautifully furnished apartment. Special discount for rental of two adjoining weeks. Vail's greatest treasure-Skiing while living in an apartment with a panoramic view of Golden Peak. Watching the skiing activities while sitting next to the fireplace or walking out on the balcony-overlooking Gore Creek!. 2 full baths accommodating 4 persons. Heated swimming pool, jacuzzis,van.Beautiful Vail Mountain Resort nestled on Gore Creek with mountains in the background viewed from your balcony-next to your warming fireplace. Resort includes heated swimming pool and modern Jacuzzi's. Beautiful winter escape within walking distance to Golden Peak chair lift-or use the resort bus to deliver you to the doorstep. Fully furnished kitchen and beautifully furnished apartment. Special discount for rental of two adjoining weeks. Celebrate New Year's season in style. Beautiful view of Golden Peak. Two bathrooms. Fireplace. Large balcony overlooking Gore Creek. Plenty of storage. Free bus to slopes. Beautiful Vail Mountain Resort nestled on Gore Creek with mountains in the background viewed from your balcony-next to your warming fireplace. Resort includes heated swimming pool and modern Jacuzzis. Beautiful winter escape within walking distance to Golden Peak chair lift-or use the resort bus to deliver you to the doorstep. Fully furnished kitchen and beautifully furnished apartment. Special discount for rental of two adjoining weeks. Celebrate New Year's season in style. Beautiful view of Golden Peak. Two bathrooms. Fireplace. Large balcony overlooking Gore Creek. Plenty of storage. Beautiful Vail Mountain Resort nestled on Gore Creek with mountains in the background viewed from your balcony-next to your warming fireplace. Resort includes heated swimming pool and modern Jacuzzis. Beautiful winter escape within walking distance to Golden Peak chair lift-or use the resort bus to deliver you to the doorstep. Fully furnished kitchen and beautifully furnished apartment. Beautiful Vail Mountain Resort nestled on Gore Creek with mountains in the background viewed from your balcony-next to your warming fireplace. Resort includes heated swimming pool and modern Jacuzzi. Beautiful winter escape within walking distance to Golden Peak chair lift-or use the resort bus to deliver you to the doorstep. Fully furnished kitchen and beautifully furnished apartment. Fantastic Vail Condo! Studio with fireplace and private balcony with mountain views of beautiful Gore Range. Unit has a king bed, full kitchen, free parking and shuttles to and from the lifts. Property has a heated pool and 2 hot tubs. Walk to all the restaurants, shops and lifts in Vail Village/Golden peak area with ease from this condo. Best value in Vail. One bedroom,king size bed, plus sofa bed in living room, two full baths and full kitchen, private patio overlooks Gore Creek and Vail Mtn. A few steps from heated pool and 2 hot tubs. Free parking and shuttles to and from the lifts. Located within walking distance to restaurants, shopping and other amenities in Vail Village and Lionshead. Ground floor unit, steps to the heated pool, warming hut and 2 hot tubs, private covered parking, laundry, free shuttle to the lifts. Fireplace in living room, king bed, fully equipped kitchen,private patio on Gore Creek overlooking Golden Peak. Friendly, helpful, professional staff on site. Great deal in Vail Village. President's week in the best, most convenient timeshare in Vail. Short walk to Vail Village and free town bus. Vaulted ceiling, balcony with East views over Ford Park, gas fireplace, 2 TVs, DVD player, internet access, free assigned underground parking. High end finishes & furnishings, king in bedroom, new queen sleep sofa in LR PLUS queen Murphy bed, full kitchen. Amenities include elevator, coin laundry, frequent shuttle to lifts, Sunday grocery trip, Tuesday wine & cheese party in "community" room, internet workstation in office, 2 hot tubs, heated swimming pool, ice maker, midweek maid service. Lovely condo in ideal location, opposite Golden Peak. Free shuttle to the lift daily, free grocery run on Sundays, free parking, coin laundry, 2 hot tubs and heated pool, games room. Easy walk to Vail Village. Most convenient/nicest timeshare facility in Vail. Walk to Vail Village shops/restaurants and free town bus. Frequent courtesy shuttle to lifts, and Sunday grocery trip. Attractive decor, high end finishes, king in bedroom, new queen sleep sofa in LR; two TVs, DVD player, gas fireplace, balcony, full kitchen, internet access, assigned free parking space. Easy access for loading/unloading luggage/gear and is closest to the shuttle. Resort amenities include computer workstation in the office/reception area, elevator, coin laundry, 2 hot tubs, heated swimming pool, "community" room with TV & pool table & game tables, Tuesday wine & cheese party, mid-week maid service. Ideal location at Golden Peak area, free shuttle to the lift,Sunday grocery run, 2 hot tubs, heated pool, free parking, coin laundry , easy walk to Vail Village. 4rd floor views of Gore range. Best and most convenient timeshare in Vail! Walk to Gold Peak, Vail Village, and free town bus. Amenities include 2 hot tubs, heated pool, coin laundry, elevator, internet access (and workstation in office), frequent shuttle to lifts, Sunday grocery trip, Tuesday wine & cheese party. This unit has easy access for loading/unloading luggage/gear, easiest access to the courtesy shuttle, and assigned parking.King in bedroom and new queen sofa-sleeper in LR. Gas fireplace, full kitchen, 2 TVs and DVD player. High end finishes & attractive decor. Balcony off the LR with eastern views of Ford Park. Top Floor with vaulted Ceilings and sky lights. Vail Mountain by Golden Peak. 1 Bedroom condo 1 full bath sleeps 4 with- in walking distance to mountain. Take free shuttle provided by resort. Pool, Hot tubs, gas grills gas fireplace. Game room with Free happy hour on Tuesday's. Free coffee/hot cocoa and donuts each morning. Very nice management. This place has it all! Available week 10. March 11-18, 2017. Unit is all Updated! Ideal location opposite Golden Peak, free shuttle to lift and Sunday grocery run. 2 hot tubs, heated pool, coin laundry,elevator, free parking, easy walk to Vail Village.Top floor with lots of windows, gas fireplace and Gore range view. Much less than 1/2 price - Great Ski Week! Walk or short free shuttle to slopes/village. Beautiful view of the mountain from unit. Large 1 BR, 2 BA unit. Hot tubs, heated pool. Rent for only $1,400. this is over a $3,300 value! Great Ski Week. Perfect ski week. Incredible views of Gore Creek and Golden Peak. Private balcony,heated pool,2 hot tubs,warming hut,laundry,free 2 way shuttle to lifts. LR . Fully equipped kitchen, Steps from beautiful vail village. Trillion Dollar View! One bedroom condo with two full bathrooms. Sleeps 4 with ease and great comfort! Fireplace and private patio overlooking beautiful Gore Creek and has direct view of Vail mountain. King bed, full kitchen, free parking. Only steps to the heated pool and 2 hot tubs. Walk to all the restaurants, shops and lifts in Vail Village/Golden peak area with ease from this condo. Excellent on site staff seven days a weeks. Amazing condo to enjoy all that Vail in the summer has to offer. $2500 value! views! sleeps 4: king in bedroom, queen sofa-bed in lr. spacious bath, full kitchen, great fireplace, balcony, 1-car parking. good storage, very attractive & comfortable. frequent shuttle to gold peak, lionshead, and the transportation center, grocery trip on sunday. walking distance to the village. pool, hot-tubs, grills, wine & cheese in party room on tuesday afternoon. Must see to believe! Views of Vail Mountain and Gore Creek from your private balcony. Spacious full kitchen, fireplace,king size bed, comfortable pull out couch,hot tubs,heated pool, underground parking,freeshuttle to the lifts. Walking distance to shops & restaurants or stay in and grill at the outside gas grills. Mid week cleaning and linen change. Pool towels available. Warming hut at pool. Laundry on the same floor, Move in day made easy, no steps or elevators needed to get to this unit. Much less than 1/2 price - Great Ski Week! Walk or short free shuttle to slopes/village. Beautiful view of the mountain from unit. Large 1 BR, 2 BA unit with fireplace and wifi. Hot tubs, heated pool. Rent for only $1,350. this is over a $3,300 value! Great Ski Week. 1 Bedroom condo with fireplace & private balcony overlooking beautiful Gore Creek and Golden Peak ski runs. King bed with pull out sofa. Will sleep 4. 2 full baths, full kitchen, free parking & shuttles to and from the lifts. Heated pool, hot tub and warming hut. Game room, outdoor grills. Short walk into charming Vail village and outstanding restaurants and shops. Free wi -fi. Recently renovated unit. Chrismass week ! Best view to the slopes , quiet by the river Best location in Vail 2 blocks to Cover Bridge. covered garage, all day transportation to lifts and downtown, and Lionshead . Saturday to Saturday, 7 nights. This is a great price. Check it out on The Wren website. Please contact me if there are any questions. $2500 value! East views! sleeps 4: king in bedroom, queen sofa-bed in living room, spacious bath, full kitchen, great fireplace, balcony, 1-car parking, good storage, very attractive & comfortable. Frequent shuttle to Golden Peak, Lionshead, and the transportation center, grocery trip on Sunday. Walking distance to the village. Pool, hot-tubs, grills, wine & cheese in party room on Tuesday afternoon. Much less than 1/2 price - Great Ski Week! Walk or short free shuttle to slopes/village. Beautiful view of the mountain from unit. Large 1 BR, 2 BA unit with fireplace and wifi. Hot tubs, heated pool. Rent for only $1,495. this is over a $3,500 value! Great Ski Week. Million Dollar View! Beautiful view of Gore Creek and Golden Peak from this condo. Watch the skiing action from your private balcony or hit one of the two hot tubs. We also have an outdoor heated pool and warming hut. Prime season - excellent value! Excellent property in Vail Village. Ideal location opposite Golden Peak, free shuttle to lift and Sunday grocery run. 2 hot tubs, heated pool, coin laundry,elevator, free parking, easy walk to Vail Village.Top floor with lots of windows, gas fireplace and Gore range view. High Demand Week 9 - For Sale now!Wonderful Mountain Views of Gore Range! One bedroom condo with one bathroom. Sleeps 4 persons great! Fireplace and private balcony overlooking beautiful Ford Park and Gore Range. King bed, full kitchen, free parking and shuttles to and from the lifts every 15 minutes in the morning. Only steps to the heated pool and 2 hot tubs. Walk to all the restaurants, shops and lifts in Vail Village/Golden peak area with great ease from this condo. Excellent on site staff seven days a weeks. Trillion Dollar View! One bedroom condo with two full bathrooms. Sleeps 4 persons with ease and great comfort! Fireplace and private balcony overlooking beautiful Gore Creek and the Vail ski runs. King bed, full kitchen, free parking and shuttles to and from the lifts every 15 minutes in the morning. Only steps to the heated pool and 2 hot tubs. Walk to all the restaurants, shops and lifts in Vail Village/Golden peak area with ease from this condo. Excellent on site staff seven days a weeks. Trillion Dollar View! One bedroom condo with fireplace and private patio overlooking beautiful Gore Creek and the Golden Peak ski runs. King bed, full kitchen and free parking. Only steps to the heated pool and 2 hot tubs. Walk to all the restaurants, shops and lifts in Vail Village/Golden peak area with ease from this condo. Christmas Week in Vail! Trillion Dollar View! One bedroom, two full bath condo with fireplace and private patio overlooking beautiful Gore Creek and the Golden Peak ski runs. King bed, full kitchen and free parking. Only steps to the heated pool and 2 hot tubs. Walk to all the restaurants, shops and lifts in Vail Village/Golden peak area with ease from this condo. Spacious 1 bedroom condo with spectacular views of Vail mountain. Only a few steps to lifts and to town. Great hot tubs and pool area with BBQ's. Great price for fixed Winter Ski Week 2. Unit A205. (Unit A205 Week 3 also available in separate ad for back-to-back weeks!) Next available week Jan 12-20, 2018. This is a 1 bedroom, 2 bath that sleeps 4 people (King size in bedroom and sofa-bed in living room) Beautiful views of Gore Creek and the mountains from the balcony. The Wren is within walking distance of the towns of Vail and Golden Peak. Full concierge service 7 days a week. Outdoor heated pool and 2 hot-tubs. See The Wren website for full list of amenities and photos.Maintenance fees are billed bi-annually in January and July (2017 fees $686.77 x 2)and are paid for 2017. Great price for fixed Winter Ski Week 3. Unit A205. (Unit A205 Week 2 also available in separate ad for back-to-back weeks!) Next available week Jan 20-27, 2018. This is a 1 bedroom, 2 bath that sleeps 4 people (King size in bedroom and sofa-bed in living room) Beautiful views of Gore Creek and the mountains from the balcony. The Wren is within walking distance of the towns of Vail and Golden Peak. Full concierge service 7 days a week. Outdoor heated pool and 2 hot-tubs. See The Wren website for full list of amenities and photos.Maintenance fees are billed bi-annually in January and July (2017 fees $686.77 x 2)and are paid for 2017. Look ! 1666, in 3 equal payments over 12 months for your yearly Skiing enjoyment during week 3 every year. Very nice condo overlooking Ford Park and Gore Range. Everyone Loves our Condo. Arthritis has taken away my Skiing enjoyment. Enjoy Skiing while you are able, to enjoy it. "Ed". Presidents Week on the top (vaulted ceiling) floor. Queen Murphy bed AND queen sofa-bed in living room, King in bedroom. See pix of the resort/units at TheWren.com, more information on rental ad for this unit. Maintenance fees: 1039Annual usage.An Exclusive Member of TSXchange MLS. Trillion Dollar View! One bedroom condo with fireplace and private patio overlooking beautiful Gore Creek and the Golden Peak ski runs. King bed, full kitchen, free parking and shuttles to and from the lifts. Only steps to the heated pool and 2 hot tubs. Walk to all the restaurants, shops and lifts in Vail Village/Golden peak area with ease from this condo. Excellent property in Vail Village. Ideal location opposite Golden Peak, free shuttle to lift and Sunday grocery run. 2 hot tubs, heated pool, coin laundry,elevator, free parking, easy walk to Vail Village.Top floor with lots of windows, gas fireplace and Gore range view.Week 9 is in high demand. Beginning of Spring Break! Easy access unit. See resort/units pix on TheWren.com, see info on this unit in the rentals ad for this season (2018-19). Week 10 in this unit is rented for 2019, will be for sale later, if you want back-to-back weeks. The Wren is an RCI gold crown complex. Recent sales have been in the $6,000 to $7,000 range. $671 dues yearly. View of the Gore Range mountains. Shuttle van service to the ski slopes. Week 9 is March 1st to the 8th. Trillion dollar view! only timeshare condo on the top floor facing the ski slopes. week 10 is one of the absolute best ski weeks in vail with longer daylight hours, extended lift operation and more mild temperatures. one bedroom condo with two full bathrooms. sleeps 4 persons with ease and great comfort! fireplace and private balcony overlooking beautiful gore creek and the vail ski runs. king bed, full kitchen, free parking and shuttles to and from the lifts every 15 minutes in the morning. only steps to the heated pool and 2 hot tubs. walk to all the restaurants, shops and lifts in vail village/golden peak area with ease from this condo. excellent on site staff seven days a weeks. Excellent property in Vail Village. Ideal location opposite Golden Peak, free shuttle to lift and Sunday grocery run. 2 hot tubs, heated pool, coin laundry,elevator, free parking, easy walk to Vail Village.Top floor with lots of windows, gas fireplace and Gore range view.Week 10 is a great March ski week. Trillion Dollar View! One bedroom condo with two full bathrooms. Sleeps 4 persons with ease and great comfort! Fireplace and private patio overlooking beautiful Gore Creek and the Vail ski runs. King bed, full kitchen, free parking and shuttles to and from the lifts every 15 minutes in the morning. Only steps to the heated pool and 2 hot tubs. Walk to all the restaurants, shops and lifts in Vail Village/Golden peak area with ease from this condo. Excellent on site staff seven days a weeks. Experience spring skiing at its finest. Enjoy your morning coffee surrounded by mountains and the refreshing sound of Gore Creek.Shuttle to Golden Peak speed lift on the half hour.After an invigorating day of skiing,relax in our 99 degree heated pool or 2 hottubs.Cook your dinner in the full kitchen or take the easy walk to Vail Village for outstanding dining, shopping, and night life. Super deal! Bargain price on a red time unit the last week of ski season in Vail Village. Ground unit, steps to the pool and hot tubs, overlooking Gore Creek and Vail Mountian. A great price for a ski week in Vail Village. Spectacular views of the Gore Range over Betty Ford Park. Buy the appartment at the very well locate , refurbished Wren at Vail. Wonderful December not crowded yet, and the large appartment 216 has 2 bethrooms, Teo bathrooms ,livign room with dining table and fireplace. The master bedroom with wonderful views and a 2nd fireplace. offer accepted - unit 407, the wren at vail spacious condo with luxurious vaulted ceilings overlooking golden peak and the creek. christmas week! a five minute walk to slopes, and convenient shuttle available.week 52 is the popular holiday week! great rentals.vail mountain is north america's premier ski resort, this is a great opportunity to own a christmas week at a world renown resort! Prime ski week between Christmas and New Years. In downtown Vail Village. Great view of park and Gore Range. 2010 includes week 53 with no additional HOA fee. Email with questions. Below is a list of some visitors who have signed up recently to be notified of new postings on this site at this resort and the area nearby. When you post a rental or for sale ad a notification e-mail goes out to everyone that has signed up to be notified.